Wouldn’t it be great if there was a great hand from heaven pointing to the right decision? We can procrastinate as long as possible, but eventually the time will come when a decision has to be made. Decisions are tough because of the consequences that linger afterwards. 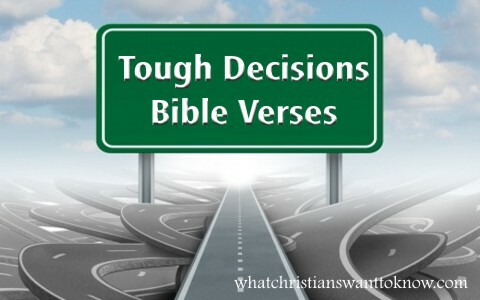 What Bible verses can help in the days of tough decisions? We should always begin with asking God for wisdom. The wisdom that comes from the world brings a pseudo-temporary peace followed by more frustration. The wisdom from God brings peace and life even when it gets tough. When we pray in faith believing that God will give us wisdom to make the best choice, He responds and gives us more than what we need. “The precepts of the Lord are right, giving joy to the heart. The commands of the Lord are radiant, giving light to the eyes” (Psalm 19:8). When making the tough decisions, it’s important to search the Scriptures that can speak to our situations. It’s a wonderful and joyful moment of discovery when we find a specific Scripture that speaks to us in the decision making process. Memorization is simplified because we are living and breathing His word while sensing His presence with us. Sometimes when we are pressed to make tough decisions, there’s the temptation to be quick and presumptuous instead of waiting on God. Being still before God means that we will have periods of time when it seems like nothing is happening. Yet in the Spirit the Lord is moving on our behalf. This is a time of quiet reflection and meditation with thankfulness because of the Lord’s goodness. “Walk with the wise and become wise, for a companion of fools suffers harm” (Proverbs 13:20). Everyone can have an opinion on what is the best decision for you. However, it’s important to screen out the voices and hear from those who walk closely with God. Pray and ask the Lord to reveal His wise servants to you. You will recognize the Spirit of God within them because their advice leans heavily on the truths of God’s word without fear, anxiousness, or presumption. We must come to a place of recognizing our utter dependency on God. Many times tough decisions bring us to see both the good and bad within us. We can’t make excuses for our sins; rather we must immediately confess them and seek the Lord’s cleansing. There’s no shortcut to dealing with sin—it must be dealt with quickly or it can pollute our choices. In the decision making process, the Lord can bring new revelations that seem out of the norm for us. Yet if we are really to walk by faith, we must keep our hearts open to other possibilities. God is above our thoughts and plans—He can move mountains of problematic choices and make a way for us. Every time we breathe in His will and breathe out our own, there is an opportunity for miracles. You may not have to make your tough decision at this moment. However you do have the responsibility to choose God. In each directive above, “God” is mentioned in some way. When we learn to make God a part of every decision—the easy and tough ones—it becomes second nature for us in our walk with Him. Hey how are you? I am righting because I am very confused. My daughter dad ask me if I could drop our childsupport case and give him a chance to take care out daughter without the courts. I want to give him a chance but I dont really know if I can trust his word. The first year he didnt do anything for her until we got a dna twst now he gives me a hundred dollars whenever he feels like and he buys her cloths wherever he feels like. I kinda want to give him a chance but I still feel like he should be doing alittle more since I been doing alone the last past year just want another person opinion on the situation thanks. Crystal, I came across your article from my WCWTK updates. Two issues. At 61, came to the Lord January 2015 and joined a Bible teaching church. Great Pastor and members. Issue #1: Establishing a relationship with Jesus. I do go to Church, however I speak out loud to Jesus everyday. Maybe three times or more. Although I pray on Sunday, I speak to Him as if he my Dad, older brother, best friend in addition to being my Savior. The conversations are as if He was sitting across the table from me at McDonalds. I do have all respect for Him, however I find it more comfortable just talking. Is this OK? Issue#2: I put my faith and hope in Jesus to help me get a new job. The job is just about one hour plus away. If I do get the job, I also see opportunity to attend a Christian college to get my Masters in Theology, and volunteer teach and minister to the area Correctional facility. All this may result in my relocation and the family doesn’t want to move. It is a good job, salary, and benefits. I need help from Jesus to decide to commute or get a low cost apartment. With my current relationship with Jesus, I am looking to Him to point me in the right direction. My past is just that…until He found me. I know He is present. Whenever I feel down and I turn on the web radio, Christian Broadcasting, my favorite artist and songs are played! This happens, day, night, during my chats with God. I appreciate His remembering me with this powerful sign. He knows I love music and singing. I suppose this is our special way of communicating. Hello everyone! I am asking for advice on a decision to make. I am friends with a brother in Jesus who attends a different church. I have gone to his church for a few services. After a few weeks, I have been invited to join his church and take part in the life of his church. But, I am stuck because I attend my church but there aren’t people around my age to relate to. They are a part of the church, but they are terribly busy with their jobs, spouses, families, or whatever. The church that my buddy is at has life transformation groups and many other activities that I could be doing. I’m not sure what to do. I have prayed to God that the Holy Spirit would guide me in my decision making. Is there any words of advice that you can give me to help with this problem? Thank you and God bless. Why not try it for a time there at your friends church. You might not have the same age group as you but as the family of God, we’re all related in Jesus Christ. You’ll never know if you don’t try Mr. Rice. Thank you sir. Good morning, I’m Colman… I have been praying about a career opportunity that I have… I was offered a position with another company making a little more money than the current job I have. However I am afraid and Confused on whether I should go over to this country not knowing what to expect with certain situations or stay where I am. My current company is a very friendly family-oriented workplace. However more money from this new job would allow me to be able to take care of my sick mother who lives far away from me and I could move her within my home once I have more money to buy a house. It would also open up the opportunity for me to use my class A CDL that I recently received back in March 2016. I’m just afraid of the unknown and not knowing whether or not I will succeed. I have prayed and prayed on this situation and now the time has come for me to make a decision. Thank you for these verses of the Word of God for seeking wisdom in making decisions. Unfortunately, I have made some decisions without seeking the Word of God. Now that I do have some scriptures about making decisions, I can read and pray about GOD’s wisdom in making future decisions. I am ashamed that I did not consult the Lord God first; however, I have asked HIS forgiveness. I must carry through with the decisions because I’ve given my word. I will ask the LORD to travel with me as I journey through the end results of these decisions. Thank you again for your article.